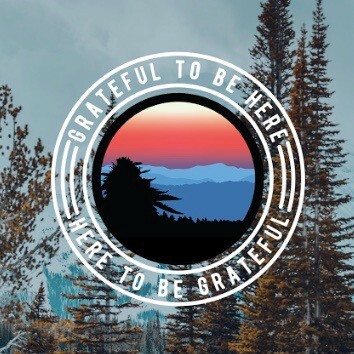 Here at Blue Ridge Hemp, we believe in the power of gratitude to transform. Every week, we use Gratitude Fridays as an opportunity to reflect and say thank you for the awesome journey that we are on. We’ve been sharing this journey on our Instagram and daily vlogs for months now, and this week we’re bringing Gratitude Fridays to the blog to give you some insight into what our founder & CEO, Will Oseroff, is grateful for this week. Micro losses are always going to be part of the journey, but on Gratitude Friday and every day of the week, we like to take time to be thankful for the macro gains, the biggest of which is all of you. Monday is our favorite day of the week at Blue Ridge Hemp, and this week we started things off right with a team lunch. I’m super grateful for the opportunity to have team lunches. I always like to think about how things were a year ago, and December of last year I was probably eating a PB&J with Jed (my dog). A year later and I’m now able to buy lunch for the entire team and enjoy that time to bond outside of work. The most important part of my busy Tuesday was that my friend Matt came into town. Matt is the producer, editor, and director (or preditor, as we like to call it) of the Inside Blue Ridge Hemp daily vlogs. I didn’t even know he was coming to Asheville this week. I woke up to a text from him that morning saying that he was on his way to pick up a drive with some vlog content. He drove eight hours in a day to pick that up. I’m so grateful to have somebody working alongside me who is so committed. In general, I’m excited about and grateful for how the vlog is coming together. Ever since January I knew I wanted to do a vlog. We tried to do it in April but it cost too much, it was too much work, it wasn’t ready, the structure of it just didn’t fall into place. So many things didn’t work out when we first tried. And now we are 68 episodes in and doing daily vlog drops. I’ve been recording every single day for over 11 weeks. I’m grateful for that progress and super thankful for the group effort that goes into that. It’s amazing seeing the impact the vlogs have on people and will continue to have in the future. When I’m grey and old I want to be watching Inside Blue Ridge Hemp and looking back on the legacy of this journey. I’m super stoked and super grateful for the meeting I had with the Asheville Bee Charmer on Wednesday to talk about our CBD honey collaboration. CBD honey is something that I’ve always wanted the business to be able to expand into. I’m grateful for the opportunity to be working alongside another local business that not only has the infrastructure and demand to make this product, but also is led by people whose values and goals align with our own. I’m also grateful for patience. We’ve had to be really patient in the process so that we can really do it right. When we started, we didn’t even know how to make CBD-infused honey. 3 weeks ago we finally cracked the code so that we can make a high quality product. This Wednesday we were able to talk about finances and labels and packaging so that we can share this with the community. I’m grateful for the opportunity to work with awesome people and to share our creations with other people. I’ve been posting about our meetings for a few months now and each time I do I get lots of responses from people who the project really resonates with. I’m thankful for the opportunity to ask our community, the Blue Ridge Nation, about what they want and get feedback about what works for y’all. We didn’t have that when we started off but now we have the ability to do that because of our amazing community. This Thursday I got to sleep in an incredible tree house Airbnb here in Asheville. I’m super grateful for this newfound connection. I just recently started working with and getting to know Nicolette and her business, Motley Hospitality. I’m super stoked about the ideas that we’re talking about. We’re in the early stages of starting to plan a CBD retreat. I got to spend some time with her talking about where things are going and working together to bring awareness to her brand, ours, and others that we collaborate with. I’m excited to see how that will blossom. When I think about it, a year ago nobody would have let me stay in an amazing mountain top treehouse with incredible views. And now I get that opportunity for myself. Super cool. Today, the entire Blue Ridge Hemp Team is grateful for YOU, Blue Ridge Nation. It’s one thing to be able to share our story and share what we are grateful for, but to be able share that with such an amazing community is surreal.